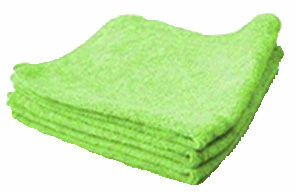 Each microfiber towel contains millions of fibers acting like tiny hooks to lift and hold dust, dirt, grease and spills. These 300 GSM heavy-duty cloths are non-abrasive and won’t scratch painted or other surfaces. And they are lint free with no need to re-wipe; and are washable and reusable, just rinse out and dry. Each towel absorbs eight times its own weight in liquid and dries in half the time as regular cotton. Try them, you’ll be amazed.